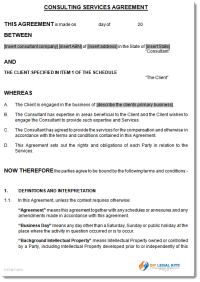 This Consulting Services Agreement defines the terms and conditions under which you are providing your specialist services to a client. We recommend using this universal document for all service engagements with your clients. In fact a solid consulting services agreement should provide the foundation for a healthy business relationship. Drafted in favour of the consultant providing the services, this document will afford you strong legal protection should a misunderstanding arise. Your professionally drafted consulting services agreement is available for immediate download. The document comes to you as a Microsoft Word and PDF template and can be used as often as you like. Simply insert the correct information in the appropriate field and tab to the next. Once completed you can now print your professional agreement! Your ready-to-use kit includes everything you need to define the terms of your consultancy service. Our fully secured ecommerce system allows you to purchase and Download your Consultancy Agreement safely. In just a few minutes you can have everything you need to protect your interests and present a professional image.